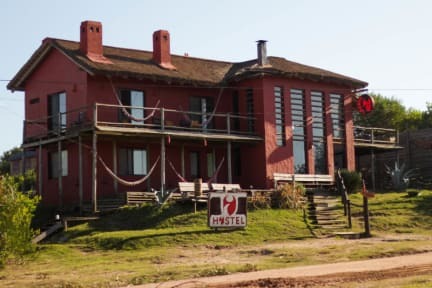 El Diablo Tranquilo i Punta del Diablo, Uruguay: Bestill nå! *In advance of the originally booked date of arrival. If booked shorter than 4 weeks in advance payment needs to come through within 48 hours. Come partake in a true boutique hostel experience on Uruguay's spectacular Rocha coast. For more than 10 years, El Diablo Tranquilo provides a wide variety of accommodations, services, adventures, and memories to travelers of all styles. Whatever your preferred method of travel, The Hostel is sure to offer what you're looking for. Even before choosing your lodging find yourself at home in our spacious lobby, surrounded by 16 foot high windows looking seaward, a massive hearth and fireplace in front of cozy sofas, and the always friendly faces found at our reception desk. Above you'll find the breakfast area and shared kitchen, and beyond that the intricacies of our traditionally woven thatch roof. Additional communal areas include a beautiful balcony, book nook, and the picnic tables and hammocks outside in the front yard. You can choose between mixed or female dorms, private singles, doubles, triple, or - for a real treat - book yourself into one of our suites and enjoy a private fireplace, full bath, ocean views, and a lovely balcony to doze away while contemplating the waves. Above all we understand that your travel will be defined by memories, and our goal is to provide you with what you need not just to eat and sleep, but to facilitate all those hard to place things that make a place stick with you. Those things which ensure that you leave Punta del Diablo as we did the first time; at peace and brimming with stories to tell and friends made. My sister and I were not certain what to expect when we arrived at the hostel, as it was low season, but the staff (a mishmash of hangers-on from the high season and guests- that had stayed long enough to be staff by definition,) soon made us fall in love with the place. In the low season there was not too much to do, we had an AMAZING trip on horseback with Fabian, a truer gaucho than most, that we booked through the hostel. The manager, Mark, was always at hand and helpful.